2015! The coming of the new year heralds the first anniversary of my offical retirement - but the second anniversary of my freedom to live life without the pressures of work! Determined to live well in retirement the last two years have surpassed my wildest expectations! So here's what I'm looking forward to in 2015! Married in 1975, John and I will celebrate our 40th Wedding Anniversary in March! What an amazing journey it has been - I am grateful for every minute! Later in the year John turns 70 years young! And I mean young! Just how we go about celebrating these momentous milestones is currently a work in progress! We do love spending time with these precious people! 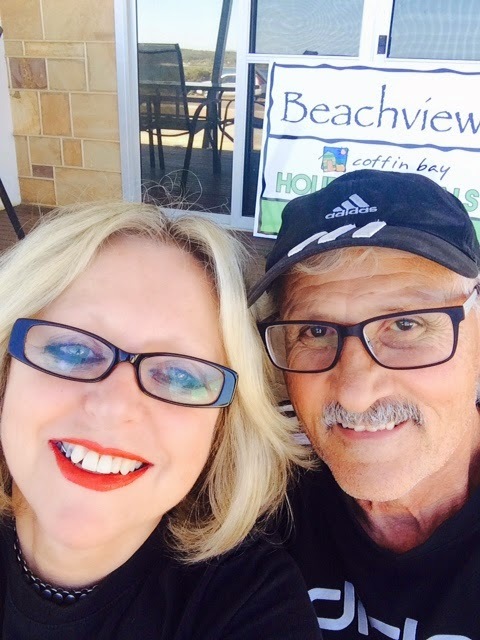 Now that the renovation of the beach house at Coffin Bay is complete - and we can comfortably accomodate all of us - we have reserved blocks of time to spend together! Shared adventures swimming, fishing, boating, climbing sandhills, walking beaches, beach cricket and football and keeping a count of the local wildlife - particularly the kangaroos and emus that frequent the back yard and nearby areas are greatly valued by us all! Having had major surgery during 2014, and then more recently suffering a lower back problem, I am determined to regain my health and flexibility. There is nothing like a period of poor health to make one appreciate the value of bursting with energy and vitality! The USA trip is planned and paid for! We can't wait to see and experience places we've only ever seen in movies and read about in books! It's a girl thing! Having settled into a retirement lifestyle that suits us I'm looking forward to really refreshing my wardrobe! Out with the old and in the new, I say! The old power suits will make way for stylish, fun, more casual clothing plus gorgeous shoes and boots that reflect our active and engaged retirement lifestyle. It will be a whole new me! Those of you who read this blog regularly will already know how much I value learning! My learning goal for 2015 is tackle an online learning course in photography. I am especially keen to learn more about landscape photography prior to our USA adventure. In doing so I will become a true 21st century learner - that thing I talked so much about as school leader! I really enjoy engaging with the world through social media! Currently I have 53,600 followers on Pinterest, 784 followers on Twitter, 52 followers on Instagram - which I have recently discovered and love, and 33 followers on Google+ - a platform I profess I really don't understand! Plus the blogs - The Living Well in Retirement Challenge, Apricot Tart, and Watching My Garden Grow - of course! I am keen to see by how much I can extend the reach of each of these. In 2015 I am aiming to blog more regularly - it's just that life gets in the way sometimes! I have good intentions so let's see how I go! Your encouragement and comments will help here - there is nothing more motivating than readers commenting on your blog posts! I thank you in advance! Having completed the renovation of the building at Coffin Bay our next project is redesign of the outdoor spaces. There are lots of challenges and a great deal of work to be done - placing a shed that will allow for the boat and trailer to be reversed into it, creating a modern, mediterranean style outdoor kitchen, and landscaping and planting to create a cooling micro climate - particularly during the heat of summer. Finally, I intend to make the most of every day and every week of this year - life is too short to be miserable, to procrastinate or to be apathetic! Life in retirement is meant to be lived well! What plans do you have for 2015? What a wonderful start to the new year for you and John, Marian! May it be a wonderful year filled with good things from end to end! Hi Liz! We are looking forward to some long awaited experiences in 2015! I hope you and Pete have an amazing 2015 as well! This is an excellent list of goals for 2015. Keeping fit and healthy is always high on my list and interacting with family and friends. I intend traveling to the US and doing a cruise around Mexico and the Caribbean. I'm undertaking a course in Tourism, trying to work harder at my blog and part-time writing career. 40 years of marriage is a remarkable achievement! Congratulations!! Hi Kathy! I can't wait to hear all about your achievements this year! I follow your blog with great interest and enjoy reading it immensely! Best Wishes for 2015! All good things to aim for even if we aren't yet at retirement age. I particularly like Number 2 though life gets in the way of 7 and 8. I must try harder! Hi Anne! Retirement is proving to be well worth the wait - and the hard yards put in preparing for it!!! Spending time with our family 'making memories' means we have great stories to share and laugh about always! With 7 and 8 I aim to get better - but I will always putting living life to the full first!Thank you so much for dropping by! Happy New Year! Hi Jean! Thanks for your anniversary wishes - it's amazing how quickly those years have passed! And what amazing years they have been! Thanks for your feedback re my energy and enthusiasm - I will value you as a regular to my blog! You now have time to relax and enjoy all the simple things in life. Retirement is right around the corner and so many of the items on your list are ones I am looking forward to - spending more time with family, revamping my wardrobe, focusing on health and fitness and simply relaxing and enjoying life.